Turkish forces which entered Syria in late January have reportedly conducted a gas attack against Kurdish militias in the village of Aranda, sending at least six civilians to the hospital according to Syrian Kurdish forces and local media. Another Doctor, Khalil Sabri, told local news "all of them suffer the same symptoms of suffocation, malaise, itching skin and burning in the eyes." At least two of the victims are listed in critical condition, while four are stable. A spokesman for the Kurdish YPG militia in Afrin, Birusk Hasaka, confirmed to Reuters that Turkish forces hit a village in the northwest of the region, near the Turkish border. Meanwhile, "the Syrian Observatory for Human Rights told Reuters that Turkish forces and their Syrian insurgent allies hit the village on Friday with shells. The Britain-based monitor said medical sources in Afrin reported that six people in the attack suffered breathing difficulties and dilated pupils, indicating a suspected gas attack." As we reported weeks ago, Turkish ground forces crossed the border and pushed into northern Syria’s Afrin province on January 20, Ankara said, after launching artillery and air strikes on a U.S.-backed Kurdish militia it aims to sweep from its border as part of "Operation Olive Branch." 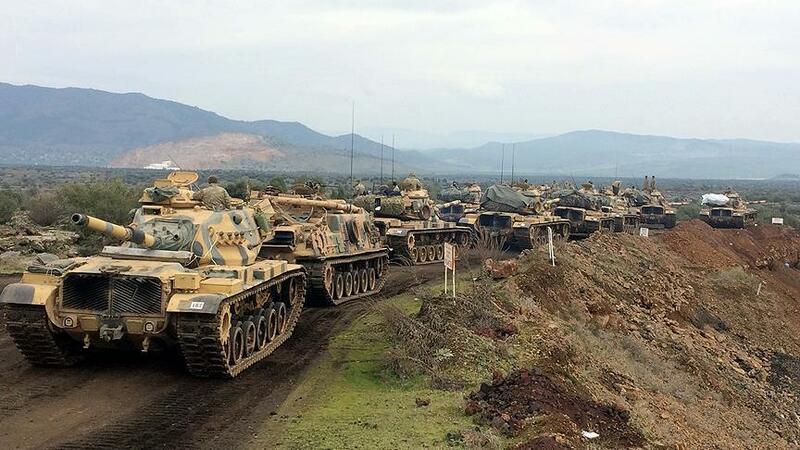 Turkish armored divisions crossed into northwest Syria following a day of airstrikes targeting Kurdish YPG forces ("People's Protection Units") in and around Afrin to drive the US-allied Kurdish militia from the area. Following the incursion, Turkish forces set out "liberating" village after village with the support of the anti-Assad Free Syrian Army. Turkey's aggression has drawn the attention of NATO allies, with top French officials warning Ankara against "adding war to war" in Syria, while Germany is holding off on new weapons supplies. We would be remiss not to point out that French President Emanuel Macron threatened to strike Syrian forces if evidence is found that Bashar al-Assad used chemical weapons on civilians. One wonders if Macron will apply the same standard to Turkish forces operating inside Syria? The United States, meanwhile, has troops stationed a mere 60 miles from Afrin in the town of Manbij, where they are supporting the Syrian Defense Force (SDF) - a militia with strong ties to the Kurdish People's Protection Unites (YPG), one of Turkey's primary targets. Turkey has threatened to set it's sights on Manbij after it's done with Afrin, while Secretary of State Rex Tillerson has assured Ankara that U.S. support of the SDF is "limited, mission specific, and provided on the incremental basis to achieve military objectives only." That said, diplomats for Turkey and the United States have agreed that relations have reached "a crisis point." On Wednesday, eight Congressional Democrats released a letter expressing grave concerns over "Operation Olive Branch," noting that over 5,000 people have been displaced by Turkish operations in the region, and concerns by UN officials over the "dire humanitarian crisis" in the Afrin region.